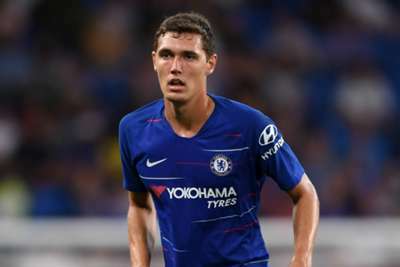 Maurizio Sarri is "not interested" in threats made by Andreas Christensen's father that the defender could ask to leave Chelsea in the next transfer window. Denmark international Christensen said this month that he may look to depart Stamford Bridge if he fails to force himself back into the first-team reckoning. Christensen has struggled to nail down a regular spot this term, with boss Sarri employing a four-man defence and choosing to regularly partner Antonio Rudiger alongside David Luiz at centre-back. Indeed, the 22-year-old's only appearances this season have come in the EFL Cup and Europa League, leading his father and agent Sten to tell Danish television that they will ask Chelsea for a January transfer if the situation does not change. But Sarri, who insists Christensen still has a future with the Blues, is giving those comments little thought. Speaking at a news conference ahead of Saturday's Premier League clash with Manchester United, Sarri said: "I am not interested in [the father's comments]. What can I say? "I think that in the first part of the season David and Antonio have played very well, it is not easy to change. "In our last six matches, Christensen has played in three matches. I think for his father he thinks he is not important, but for us he is important. "He is very young, he has to improve, but I think he is a technical defender so is suitable for my way of football. In the future he will be able to play very often."